On Friday, July 17, 888 Holdings Executive Chairman Brian Mattingley, Chief Operation Officer (COO) Itai Freiberger, and Chief Financial Officer (CFO) Aviad Kobrine participated to a public call to expand on the $1.4 billion deal that will allow the company to take control of the bwin.party Group. During the call, the three top officials from 888poker's parent company spoke about the opportunities connected to the takeover operation and explained that this should be seen as an important moment for the future of the gaming industry. "We have been in the industry for a long time and [we] have been looking for transformational opportunities," Mattingley said. "We believe this [deal] will create one of the world's leading online gaming operators. This is a significant deal for the industry, as well as 888; it's another landmark in the process of consolidation as major players position themselves in a growing market." This deal will create one of the world's leading online gaming operators. According to Mattingley, the combination of the two businesses will generate significant costs and revenue synergies for the shareholders. "We are very excited about the potential of the combined business and are confident that this transaction will generate significant value for shareholders over the coming year," Mattingley said. "We believe this deal provides us with the opportunity to create a world-leading online gaming business with a leading position in many geographies with an enhanced product and brand offering," Mattingley continued. During the call, he also expanded on the role that the enlarged group will have in Europe's regulated countries, mentioning, "The enlarged group is expected to be a leading player in Belgium, Denmark, Germany, Italy, U.K., and Spain, with 56 percent of its revenue coming from regulated or nationally-taxed markets in Europe and in the U.S."
Pleased to illustrate the diversification of 888's portfolio, Mattingley added that, thanks to the acquisition of the bwin.party Group, "The combined group will have a balanced product portfolio with no one vertical having overall influence in the mix." The enlarged business will be positioned to benefit from a greater scale with pro forma combined annual revenues of more than $1 billion. "The board of each company believes that the offer represents a transformational value creation opportunity for both 888 and bwin.party shareholders," Mattingley said. "The enlarged business will be positioned to benefit from a greater scale with pro forma combined annual revenues of more than $1 billion." 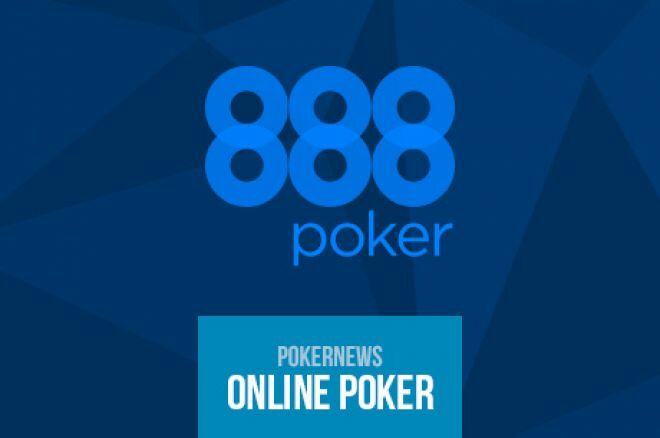 The 888 Executive Chairman also added that the group will benefit from an enhanced product offering, "with party's bwin leading sports product joining 888 established products in poker, casino, and bingo. 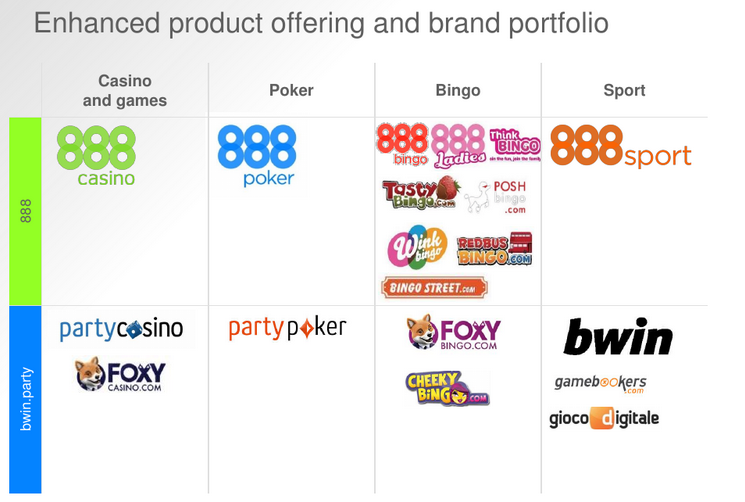 The bwin, partypoker, and Foxy Bingo brands will join 888 already popular brand portfolio. This deal is another important development in the process of industry consolidation. [It] will enable us to bring our industry-leading back office and CRM systems to a much broader pole of customers and brands. "The business will also benefit of significant cost synergies, including the rationalization of some operational and support functions, as well as greater efficiency in purchasing marketing and services. "Finally, and importantly, we anticipate significant revenue synergies from the combination of these two businesses. For example, we see significant scope to leverage 888 core CRM and marketing expertise across the bwin.party customer base. We will benefit from the combined poker liquidity, for both businesses [and] with the addition of the bwin sportsbook to our offer we also see the potential for significant cross-selling opportunities for our established customer base." "The operation will be financed through a new $600 million term loan and a new $50 million revolving credit facility made available by Barclays and JP Morgan," explained 888 CFO Kobrine. "[We] expect that this transaction will be earnings enhancing for 888 (excluding one-off costs) in the first full financial year of ownership. We expect the combinations of these businesses will deliver cost synergies of not less than $70 million a year (before tax) by the end of the 2018 financial year." We expect the combinations of these businesses will deliver cost synergies of not less than $70 million a year. Kobrine also explained that the offer is still subject to certain conditions, including "the satisfaction of certain regulatory conditions and the approval of the offer by the shareholders of 888 and bwin.party." He promised to release more information on that "by the end of August 2015." Meanwhile, "It is currently expected that the scheme will become effective by the end of Q4 2015 or in early Q1 2016," Kobrine said. 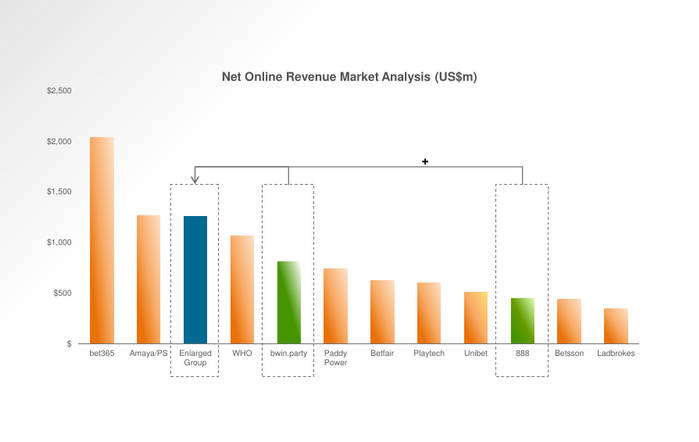 Showing a graph about the impact that the operation will have in the gaming industry (see below), the company's COO Freiberger added, "The enhanced scale of the enlarged business, with more than $1 billion in combined pro forma revenue in 2014, [positions] the enlarged group as one of the leading industry players globally." "The digital gaming platform will be combined, expanding 888 businesses in both existing and developing jurisdictions," Freiberger continued. "This will also provide the enlarged group with the ability to leverage economies of scale, as the online gaming market reaches a more mature phase." Once the merger is completed, the enlarged company will control a portfolio of nearly twenty top gaming brands across four different verticals, as illustrated in the image below. The diversification of the portfolio and the combination of the two groups is something that Freiberger believes will open the door to new, great opportunities for the enlarged group and its shareholders, especially as it "Creates additional cross-selling and marketing opportunities." "Specifically, it is expected that the enlarged group will be able to leverage 888 product offering in poker and casino alongside bwin's leading sports business." "There will be revenues synergies that we have not quantified yet, but that we believe will be significant," Freiberger went on to explain. "Our primary focus will be on implementing our industry-leading CRM tools and methodology into bwin.party." "[We will apply] our proven technology and approach to a much larger platform to work with the aim of maximising shareholders return," Freiberger promised. Want to stay atop all the latest from the poker world? If so, make sure to get PokerNews updates on your social media outlets. Follow us on Twitter and find us on both Facebook and Google+!